There's no wrong way to cook bacon -- even if you don't cook it at all. Kentaro Fukushi, a Mathematical Science professor in Tokyo, Japan recently proved as much to Munchies. He, along with his partner, Hiroshi Takai of The Garage Lab maker space, have combined cutting edge technology with their culture's deeply held tradition of eating raw meat. 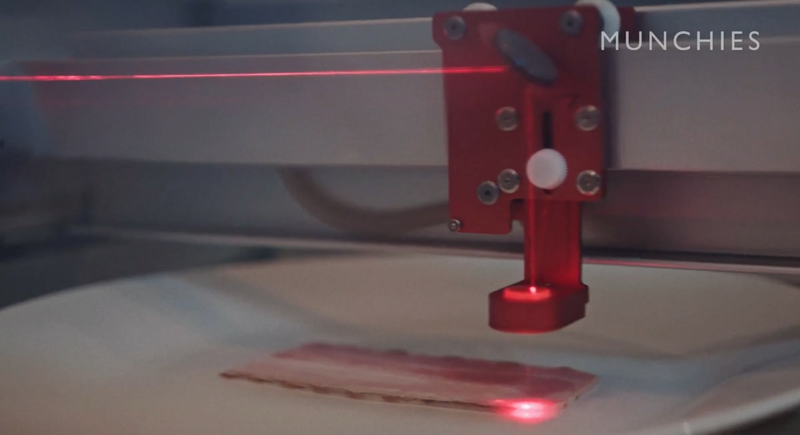 They're using a laser cutter to fry just the fat on strips of bacon while leaving the rest of the meat uncooked. His system uses imaging software to create a heat map of each strip which guides the laser so that the meaty bits remain raw. Basically, the computer only aims its laser at the white, fatty parts of the strip, baking them brown before moving onto the next white section. The process is rather slow and imprecise in its current form but the results certainly look delicious.